Promotional items may seem simple enough, but they need to achieve a lot of things. A good promotional item will establish and increase your brand’s awareness and deliver a good return on your investment. You also need to consider the impact your branded gear will have on your customers and the planet. With all of this in mind, it is worth checking out laminated, water resistant bags for your next promotional tool since they make it easy to spread your branding message in an eco way. What’s So Great About Laminated Grocery Bags? Laminated material makes great reusable grocery bags. It is constructed from recycled plastics, so it is an eco material that helps streamline the waste stream and conserve resources. The durability is unmatched so it is great for lugging home a heavy load of goods from the grocery store, and it is also water-resistant so spills and condensation are contained and messes won’t spread. Durability is a key feature for reusable grocery bags because the more durable the bag the longer it lasts, and the longer it lasts the more it is able to spread your branding message. Usability ultimately determines how long your customers will be able to use a custom laminated grocery bag, but typically you can expect something like this to last for several years. The longer your customers can use your branded reusable grocery bags, the more exposure your brand will receive. Marketing is a necessity, so why not market in a way that helps the planet? Promoting your brand with eco-friendly materials minimizes your brand’s carbon footprint. This is not just good for the planet, but it is also great for your brand’s reputation. It is becoming increasingly common for people to support brands whose values align with their own and going green is a cause a lot of people support. If you want to get the support of people who are passionate about eco causes, you need to make sure your brand is positioned in a way the does not negatively impact the environment. Utilizing promotional items made from recycled materials is the perfect way to do this. When people see your custom branded reusable grocery bag they will realize your brand is thinking about the long-term impact of your marketing items and looking to reduce the negative impact of disposable plastic bags. People who support eco causes will appreciate the way you brand has chosen to market yourself, while people who may not be as passionate about the environment will still appreciate a well-made and useful promotional item. 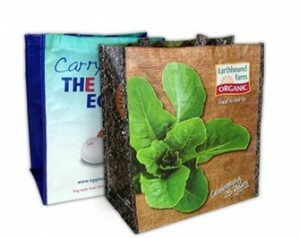 There is no drawback to selecting customized laminated grocery bags to get the word out about your brand. People may appreciate your marketing item to different degrees, but everyone will have a need for your customized bag and be able to use it. To start creating your custom laminated grocery bag, visit us HERE or fill out a quote request form on each page of our site.